Leaving the coast was hard. I love the sea so much I never want to leave, but we said goodbye to peak red trees and the known beauty of Maine. If you never let go of what you already have, you cannot get anything better, so off we went to a new part of Maine. Hoping for the best……..
We found the Lakes Region and checked into our charming new home, Wings Hill Inn just in time for tea and cookies. My, my, the cookies were tasty. Buttery and melted in your mouth. I stashed two in my room for later. I am always in search of sunsets. Can’t get enough of them and the timing is frequently off. We had a few minutes of anxiety about getting our car parked somewhere, just like in the city. Naturally, I wanted to see the sun set over the mountains and the water. The viewing had to be just perfect you know. Later we learned, all we had to do was walk from our Inn to the shores of the lake. This is the reason you want to hang out at a place long enough to get to know how to take care of your needs. Sunsets are one of my huge needs. I slowly watched the sky turn into raging colors…….. This sunset alone, was worth leaving the coast for, the sunset was prettier than any I have ever seen on my many trips to the Maine coast. One of the innkeepers, Chris said, “Gorgeous sunsets are consistent, night after night.” A place you can count on getting your sunset needs met is a rare place indeed. Keep that in mind. Who would expect to find elegant dinning in the rural regions of Maine? Wow, were we pleased to get good coffee and eggs benedict, my favorite, with extra hollandaise. Reading the press on the walls, we discovered, we had landed in the middle of two chefs, married to each other, both graduates of the American Culinary Institute. Besides the A+ food, there were nice little extra touches, like our names on the menu welcoming us and saying goodbye to those who were leaving. Felt good. After a friendly chat and recommendations from Tracy, the other innkeeper, we headed out for a day in nature. We took a vista lovers hike, looking down on the many lakes in the area. The trees were past peak, but still mighty good looking. This hike was for Jenna who loves the views on the hills. Next we walked in a clean, pure forest, miles and miles of pristine nature. This hike was for me. I need to be in the middle of the forest, surrounded by her energy. These pristine trees felt so good to walk in, around and among. The smells in the forest brought me deep pleasure and reassurance. My goal was to take nature’s energy back home with me to the city, so I soaked reality up and stored her power inside for later. We even had time for a short kayak trip on a pond before getting cleaned up for our 5 course dinner. How perfect is that? A day in nature, wild and free; and then a gourmet dinner right at our own home. Didn’t even have to drive anywhere to get there in the dark. We had a bottle of Pinot Noir in the trunk of our rental car, which was perfect for whatever we choose to eat. I have to tell you the truth. The meal we had at Wings Hill Inn, ranks close to the top of my list. The only other meal that tops it, is the one I had in Fountaine Bleu at the Black Eagle restaurant in France back in 1995. Admittedly I have not eaten at every great restaurant in Philadelphia or the world, but Wings Hill Inn is at the top of my list in America. The food is worth going to the country for. I had two, new peak experiences, one with Tracey’s French Toast and the other with Chris’ delicate, creamy celery soup. Heaven. Fresh, clean nature and excellent gourmet food, a combination which is hard to find and even harder to beat. Here I am saying goodbye to a 175 year old tree that lives in the Inn’s yard. My, My Maine. I love Maine. We were heading up the coast, as you remember, from a refreshing, grounding walk in Wolf Neck Park. Our room was waiting for us, at Bath, Maine. We remembered our last visit, in these parts. It was most unpleasant because we did not have a home for the night. This section of Maine is one of the prettiest places to play. I like to play, which means, not knowing where I am going every minute of the day. I want to relax and flow. Being out in the wilds is wonderful, but when there are no rooms in an area I get nervous so I cannot relax and enjoy myself. Last time we were in Bath, it was late at night. We were frantically looking for a room in the driving rain. We drove down many dead ends, before becoming weary, giving up, and leaving this cute little town. We ended up with a dirty room and terrible, tasteless Chinese food for dinner….twas the only choice, late at night, in these parts. This was my payment for playing all day at the dreamy, foggy, beach parks. This is one of the areas where all those land fingers reach out deep into the sea so the earth is craved out in luscious views and vistas. But few rooms in the inn. Learning our lesson, we planned ahead. Research on google turned up The Inn at Bath, how easy is that to remember? Right in the middle of town. The colors on the trees were peaking in the town and at the beach. Vibrant Moments where happening all over the place. Being in the middle of colored trees all around you is heaven. Being at the beach is heaven. Put the two together….wow! Elisabeth Knowlton, the Inn Keeper and owner, was a well organized host. Our key was there, the fireplace was there, the hot tub was there and we could relax and savor our day in Nature and look forward to playing in the fingers. For dinner, she sent us up the hill, a few short blocks into the cute town of Bath. We walked among colorful trees to the Solo Bistro. Food for picky people. Pleased the taste buds and so so upscale. Who would have thought you could find fine wine in Bath? Perfect for us center city folks. The man on the left gave me some marketing tips. Amazing what you learn from others. 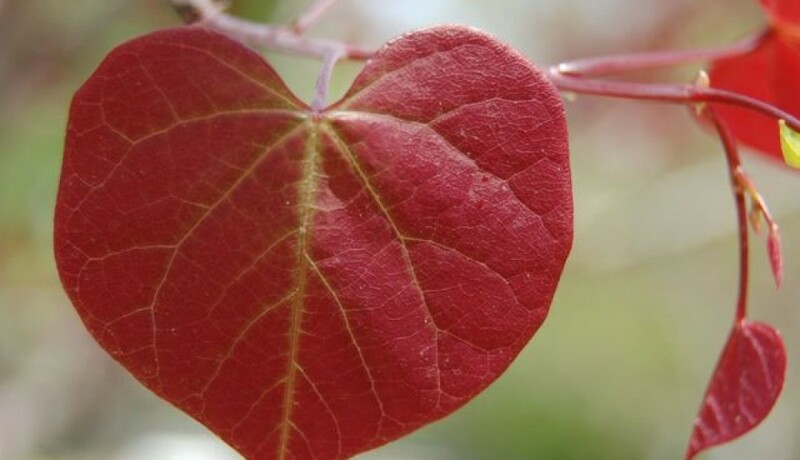 Sign up for your free holistic psychology, mind body spirit ezine, The Vibrant Moment now. The Visit to Rachel Carsons park happened after a luxurious stay at the Cliff House in Maine, where I had my very first body wrap. Was pleased and surprised a strange shiny material could relax me so much. I could not move from the recovery room for hours. Just sitting and enjoying the feel of the body in a nonresistance state…..Jenna, my traveling partner, was able to sit still for the same amount of time which is quite remarkable for her. She had the same body wrap, a Juniper one……both of us, limp, in bathrobes, looking out over the cliffs and sea……yummy. They even had a lap swimming pool for us to use. 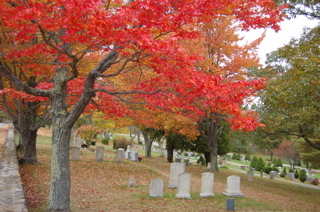 On the way to the Inn by the Sea in Cape Elizabeth, we saw the most gorgeous red maple tree in a graveyard. Colored autumn trees in cemeteries are one of my most favorite things to photograph. Here is one of them. Blown away by the Inn By The Sea, it is better than most houses, we decided to eat in our lovely living room for the evening. All of our plans to go into Portland, only six miles north, for an night out on the town disappeared as we enjoyed our warm, cozy home. The wine we bought on sale was terrible but who cared. The weather was misty and other worldly. The private walk to the beach was satisfying in autumn tones and sea salt breaths. The Inn By The Sea is a major leader in Green Lodging, which I am going to tell you lots more about. They get high marks from me and I plan to have them on my radio show, “Live at the Edge” so stay posted. I want them to tell you all about Green Lodging. Next we hit the outlet at LL Bean, of course… However, we didn’t buy much for a change cause they have outlets in Delaware now so it is not the big deal it once was…. When I am in this area, I have to go by Wolf Neck Park. My memory was so bad about how to get there we ended up having to back track 20 miles to find it. It is hard to find, so ask someone in Freeport before you leave to get on the correct, rural road. A small, but pretty, water- earth- forest park by the sea. Walk with your bare feet on the pine needles and wet green moss. Sit in the sun and feel warm and loved by Mother Earth. Let the sea clear you of clutter.